Just about everyone gets that tingly feeling in their legs once in a while. Maybe you just sat cross-legged or stood in one spot for a little too long, or slept in an odd position. These temporary feelings of pins-and-needles, fortunately, are usually nothing to worry about and typically go away quickly once you remove the source of the pressure. However, if you start getting that tingling feeling frequently, there’s a chance it may be a symptom of a much bigger problem—peripheral neuropathy. And if that’s the case, the long-range consequences could be much more significant than a little tingling. (Fortunately, we can help—more on that in a minute). Here’s what’s going on. Tingling feelings could be the result of temporary physical pressure on the nerve, but it could also be a sign that the nerves themselves have been damaged systemically. For example, high levels of glucose in the blood—common for those with diabetes—are toxic for nerves. 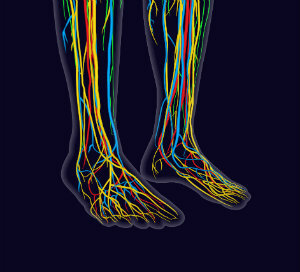 Being furthest from your heart and supplied by lower overall levels of circulation, the nerves in the feet and legs (and often the hands as well) tend to be the first to experience symptoms. Without treatment, more and more serious symptoms and problems begin to creep up. That momentary tingling may turn into consistent, radiating pain that may feel like shocking, burning, freezing, or stabbing. Eventually, you may lose sensation in your foot entirely. And if you can’t feel your feet—or you’ve learned not to trust your senses—you may not realize when a serious injury or wound has occurred. This frequently happens to people with diabetes, and since their immune systems are also compromised, those resulting wounds can lead to infection and even amputation. The whole process may happen relatively quickly, but often it develops slowly, over years or decades. The last thing you want to do is wait until the problem is severe before you do something about it! Being proactive at the first sign of trouble allows you to mitigate a lot of the risk and save yourself from years of pain, or even permanent loss of sensation. Even better news: treatment for peripheral neuropathy is much more advanced now than it was even a few years ago. It used to be thought that nerve damage was permanent and reversible, but new technology is helping many patients to actually recover healthy nerve function. At Absolute Foot Care Specialists, we offer state-of-the-art combined electrochemical treatment (CTET), which uses both an electrical signal therapy and local anesthesia to relieve nerve pain—and often help nerves repair and recover. Don’t let the long term consequences of tingling feet creep up on you! Stop them early with state-of-the-art treatment from the Absolute Foot Care Specialists. Give us a call today at (702) 839-2010.